Standing upon a slab of moss-covered granite, deep within a dense tropical jungle, an enormous idol in the image of a black spider looms over an hourglass-shaped pool of luminous red liquid. Made from a single massive block of obsidian, the spider’s body stretches nearly 50 feet long. Its legs are also fashioned from obsidian, and despite their slender profile, they manage to hold the body several feet aloft, rising like treacherously narrow stairways to the spider’s back, 20 feet above. A pair of obsidian shards over 3 feet long curve down from the spider’s head, signifying its fangs, and a group of hemispherical red crystals represent its eyes. Ten 50-foot-tall stone pillars surround the spider, each one covered with obsidian tiles bearing primitive pictographs of humanoids, spiders, and other vermin. Jungle vines and creepers wind their way around several of the tall black pillars, but the huge stone slab serving as the site’s foundation holds the undergrowth largely at bay. At the northern edge of the shrine, near the ends of the spider’s forelegs, crumbling stone steps descend 3 feet into the undergrowth. Countless flying insects buzz through the humid air, and tropical birds call in the distance at irregular intervals. Here and there, dappled sunlight filters through the jungle canopy above, glinting off the obsidian monuments. Sharp-eyed observers might notice that fine strands of spider silk stretch between some of the pillars. 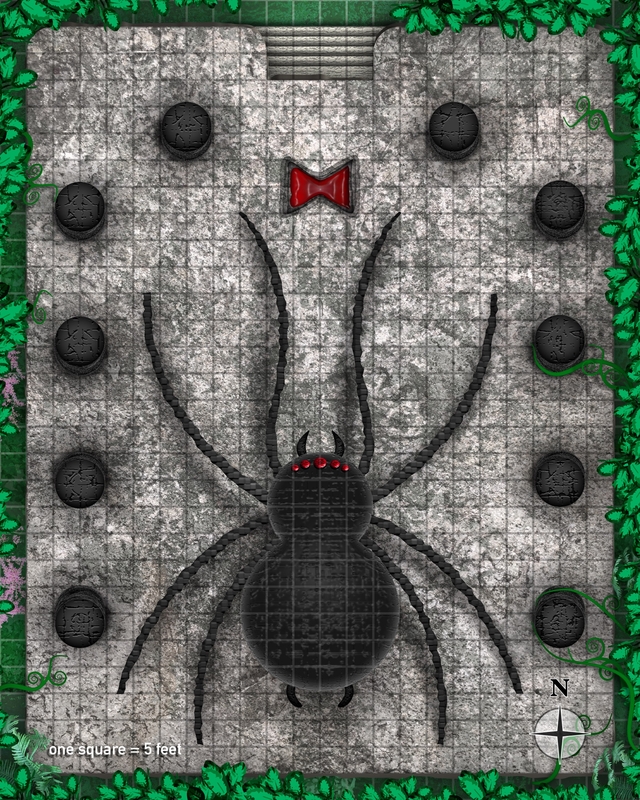 Those with even sharper eyes might notice one or more giant black spiders lurking around the tops of the pillars, their shiny black bodies blending in with the obsidian tiles. Built ages ago by a cult of primitive vermin-worshippers, the shrine was used as a site of ritual sacrifice for several decades during the cult’s heyday. Then, surrounded by their enemies and facing certain doom, the cultists performed one last ritual, sacrificing themselves to infuse the shrine with powerful magic and portions of their own evil souls. Through this ritual, they hoped to escape their foes and one day rise again. Escape they did, but not in the manner they expected. For centuries, the shrine has remained undiscovered, harboring the cultists’ evil souls within the spider’s obsidian body. But now, the souls have become restless, as the conditions necessary to set them free are nigh. Congratulations, Joe. Putting yourself out there to compete in anything is hard, and designing RPGs is hard. Particularly designing adventure settings or locations. You have to be able to suggest some ideas about personalities, plots, terrain, and more, and have GMs chomping at the bit to add your location to their regular game. Let's see how you did! I believe in positive feedback and honest criticism that should make you better at every part of this gig. So to start positively, I want to say that this site really captures the imagination. When a long time GM can't make his mind between wanting to run and en encounter in your location, and wanting to play a character in it, you are ding something right. Strong, descriptive language paints and picture AND sets a mood. It feels like a peaceful, overgrown sight I might happen on by accident, before realizing Something is Very Wrong. And that's when the murders began. There is such a thing as over-writing. I'm experienced with this so I can advise you on it. : ) There's a subjective point at which too many adverbs and adjectives slows down the reader and distracts from the overall feel. Avoid unnecessary adverbs (a stone slab hold the undergrowth at bay. It doesn't need to hold the undergrowth largely at bay) and remember not every noun needs an adjective. Your writing is excellent, too much descriptive count can push you over word count. Be wary of your use of dependent clauses and have the discipline to split an involved sentence into two. Your introduction is very evocative but that first sentence could benefit from being split and refined a little. You do a great job of describing the area and setting a feeling, though. These are just things I learned over time. Any time you have something that PCs might want to destroy, which is every time, include details so a GM doesn't have to look up rules. Where necessary, invent rulings. If the spider's body is 20 feet thick but made of dense glass, you might rule it has a hardness of 3 and 3 hp/inch of thickness instead of 1 and 1. More if it's magically protected. The location has no traps or encounters built into it. It's cool that I can manifest the cult however I want and that the location tells a story all by itself. But a trap or other feature can suggest the CR you're aiming for, whether the spider animates (are there divots in the slab and tiny shards of glass everywhere? ), etc. If I'm judging a place to adventure, I want some crunch to go along with my fluff so i can know whether I'm hiring a writer or a designer or both. This entry is a good read and I already have plans to yoink it for an upcoming campaign. Great job and good luck in this contest! This location does something unusual compared to most of the other entries and jumps right into its physical description. It’s a colorful description and presents a clear description of the spider statue. I am left with the question about why the hourglass is separate from the spider’s body, but this leads me to come up with reasons for its detachment rather than scratching my head. I wonder if you buried the lede by not presenting the shrine’s history, but I kept reading in anticipation of discovering its origins, so it worked for me. Obviously, with a spider motif, GMs can populate this location with appropriate threats, but it would have been helpful to indicate the kinds of threats PCs might encounter. For example, do ettercaps roam around the perimeter waiting for the cultists to break free of their imprisonment? I also would have liked one possible way to free the cultists’ souls. Your map is perfectly clear, and the accompanying description gives the reader all the information needed to stage an encounter at the shrine. I enjoyed reading this. You hit most of the senses in your description. I didn’t notice any glaring grammatical errors. Overall, this is a cleanly presented map with terrific description. The only real mark against the location is the lack of clearly defined threat, but that does not detract enough from my decision to recommend this for advancement. You paint an evocative picture of this location -- a spider-themed haunted shrine -- right off the bat, presenting something that could be the culmination of a jungle adventure or a mere random encounter/location as the PCs explore a swath of the jungle. Your writing is clear, hitting all the senses, and the location interesting. It's easy for me to picture an adventure with the cultists' souls turning it into an animated killing machine, or just having it be some mystery that the PCs stumble on and hopefully are intrigued enough that they want to know what's going on with it. I think it is strange enough that it'll give PCs a reason to want to find out what its history is, and that's great for a GM. Despite that concern, I think the area is intriguing enough that I want to see more of what you can come up with. I do recommend this for advancement. I wanted to read and comment every entry before I gave a thumb' up or down recommendation. I am supporting FOUR entries to advance from this round based on map, adventure potential, and quality prose. And I do recommend this one to advance based on my comments above. Well done on completing your map for Round 2. First, from a cartographer's workload standpoint, your map is very finished. There's nothing much left to clean up or clarify. Not much else to say, this could have just been dropped into Dungeon Magazine's Map of Mystery spot and left alone (obviously that's not all that's needed here for this contest, but from a finished map that evokes creativity and ideas perspective). Second, from an exciting encounter and map location, it does this well. You have a raised platform, for some higher ground bonuses if defenders are fending off invaders trying to get on the slab (though this would be at your map's edges and not allow much maneuverability or view of more distant enemies). You have pillars for cover, climbing, and perched enemy archers (though in your specific case, likely web-shooting spiders), and you have a freakishly large and interesting statue, with a potentially foreboding pool for additional terrain. At its base, the map is a solid location with some room for maneuvering around the statue and a few specific enemies perched on it. Its imagery makes it good for immediately thinking up creatures to use with it (spiders, ettercaps, drow, driders, etc. ), though obviously that specific imagery also will potentially restrict it being dropped into place easily by a GM unless they're certain that they want a historical site for a spider-worshiping cult or group. This map indicates an ancient site, but it falls into a too uniform appearance for my tastes ultimately. I have no problem with the site being made basically symmetrical, with five pillars to a side and a square base slab, and the spider statue being basically centered and symmetrical, that's absolutely the nature of how it probably should have been built (and the nature of a spider's body). What I mean, however, is that as currently pictured, this site was built 'ages ago'. Unless it's been well-tended, show me that age and wear and tear that says it has the weight of ages to it. Have one column smashed and just a stub with debris hindering the area around it. Have one snapped off halfway or fallen, creating a barrier, wall, or obstacle in one area (possibly across the spider as an alternate ramp other than the vaguely-described use of the legs as ladders). You mentioned some spiderwebs that might be noticed, make a couple areas have visible spiderwebs; one or two pairs of columns with physical webbing stretched between them (at ground level) to slow movement or visibility or if you want them higher up, they can be used as bridges between the columns for spiders to maneuver off of columns if the PCs climb up one to reach them or try and smash one down. Otherwise break up the symmetry of the map, even if it means breaking off one of the spiders legs. I like the addition of the red hourglass pool. That feature makes the black widow nature of the statue very apparent, since normally such an hourglass marking would be under that spider and therefore not visible. This was a clever way to add the black widow imagery without placing it on the top of the spider's back just to fit it in. As for the statue itself, it takes up a lot of real estate. It's evocative, it has presence, it's intimidating, but without making it a threat itself (which I am not advocating from a map design standpoint, though it could be cool) it's left as either impassable space. Although you do state that it is raised off the ground and could be moved underneath, that means that figurines will have to be placed on the statue and said to be underneath, or it can be used as a firing platform for ranged enemies perched atop it (in which case we should definitely have had some more clarification on the difficulty of climbing a leg), which would only make the potential clutter and confusion of characters on the spider and characters under the spider greater (figurine-wise).